Since this was now going to be a room in which I watched television, I would definitely need an ottoman. It took a little looking but I found this one at Value Village. It had a matching chair and the two were priced at $10. They agreed to sell just the ottoman for $5. I also liked the fact that it had a goldish tan thread creating a crisscross diamond pattern. This color tied it even better to the chairs and the pattern kept it from being a big purple blob in the middle of the floor. Last night I watched a movie with my feet elevated and it was downright comfortable. There is one other piece I haven't mentioned that deserves a little background. I found this chair in the alley with one arm attached only on the front end. My brother added a doll rod and reattached it to the back. (I am positive I took pictures of this but can't seem to find them now.) So, moving on to this shot, I primed and painted the chair. The vinyl upholstery just needed to be wiped clean. Painted the chair in an olive color and it was complete at almost no cost. (In case you are wondering, It's on the list to redo the flat surface of the desk and add some black to the trim. FLASHBACK to thirty some years ago when this was my sewing/craft area. At some point it became my bedroom and now it is back to exactly where it started out at in the very early 80's. Looking a little different, but then so do I. Not so easy to "remodel" the self so I'll keep this about the decor. In those days there was no central air. As you know from the previous post, there are still lots of supplies in this room. They are just more carefully concealed. 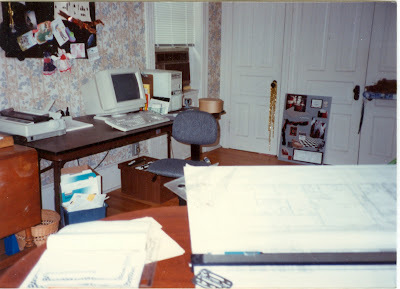 I still have the same drafting table but very rarely use it. The view from this angle is definitely less cluttered. 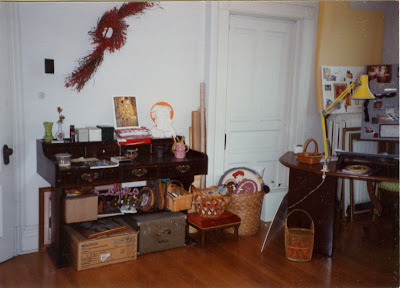 I was trying to be organized way back then. 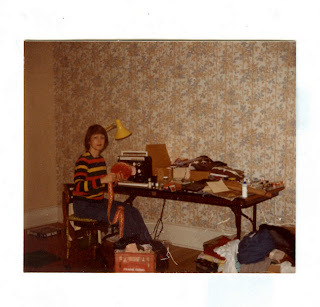 This must have been one of those tidied up moments. Still a few loose ends to tie up but almost there. Insert: This next picture was an after thought. Just when I thought I was finished with this room, I realized I had this framed piece hanging in a bathroom. Moving it to this room gives it new life and an opportunity to see it more often. I played a little musical chairs with the rest of the art work and it is more to my satisfaction. In case you missed the post on the burlap curtains, check them out. The burlap lamp shade post is another separate post. And the organization of closets is here. this vase. I found it at St. Vincent de Paul thrift shop. The materials in the arrangement are from Hobby Lobby. In the next post I'll be switching back to the work being done downstairs. I have not had dining room chairs for about seven months so I was off-the-hook for hosting during the holidays. But that reprieve will soon be over. I'll show you why in the next post. Love, love, love the table you use for a desk. 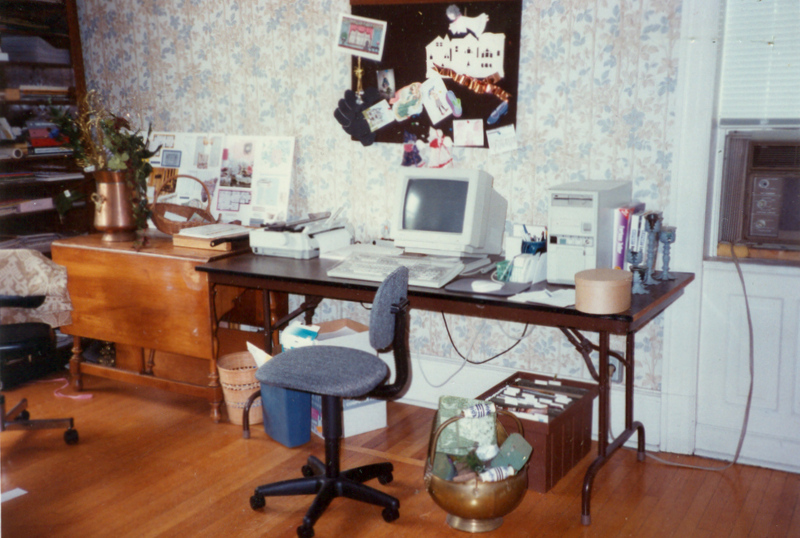 Oh, the good old days...I remember that wallpaper!